DavidNews HYIP blog - News & Reviews: Legend Investment - Happines supplier? 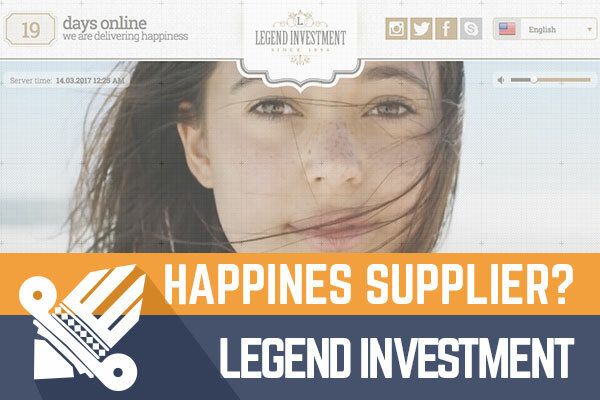 Legend Investment - Happines supplier? Legend Investment is an attractive project that was added to Golden Stage listing with $400 reinvestment, and for now it is fulfilling all promises to investors, and it delivers all payments on time. I must reveal that at least when I open this project, I want to spend in it little bit mote time than in some other projects and I'm sure by reading this review further you will understand why. Talking about Legend Investment seems that it is a well made project and it is almost impossible not to believe it. I mean that there is so much useful content that at least I lose track of time by reading it. Many people undoubtedly will feel the same, but anybody must take in mind that more experienced investor more he will understand that it is just a legend and exterior look. Of course, Legend Investment is still high-risk investment project like all others, but I believe it has great potential to run for some very decent time because it looks professional. At this moment I do not see cons for this project because it looks great and as I said there is a lot of detailed textual content and it is an attractive point for significant part of investors. The administration has published information about the company, thoroughly explained investment plan, have presented description how to invest, but the most important thing is that likewise have also done Partners section and other pages. It is evident that administration has also taken great care of member area just to make this project firm and professional. There is just one investment plan that Legend Investment provide. This investment plan simply will lock-in your investment, and you will receive returns forever. Of course forever in high-risk investment project does not mean forever, but until the moment when the project will close and we can't predict when that will happen. In any case - starting from next day until the 25th day you will receive 1% daily, after that from 26th up to 75th you will receive 1.5% return. If you calculate with me, then you understand that in these 75 days investor will reach break-even point (the moment when investor have received back the amount that he invested) and starting from that day until 150th you will earn 2% returns. After that 2.5 and onwards from 301th 3% returns. Yes, it will take a lot of time even to break even, but small profits surely will help to increase the lifetime of this project and your chance to earn with it. It will be possible to invest with most popular payment options of today - Perfect Money, AdvCash, Payeer and cryptocurrency Bitcoin. Withdrawals are not processed instantly like in some other projects, but administration promises to pay all payments within 48 hours. In conclusion, it is clear that project is done very well, and I did not mention but seems that administrator is targeting Asian countries with this project as besides English and Russian localization also Chinese, Japanese and Vietnamese is available. Of course with investment plan like this it is very difficult to predict how the project will perform but at this moment it seems quite popular, and I'm sure that in the future it will just get more and more popular. In any case - remember that this is an HYIP and invest only funds that you can afford to lose. Investment plans: 1% and growing with lifetime, initial deposit locked in the project. Did you think about exchanging with the best Bitcoin exchange company - YoBit.